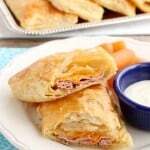 Hot Ham and Pineapple Campfire Sandwiches - Dessert Now, Dinner Later! You really don’t need to go camping to make these. Who wants to cook in this summer heat? Not me! I grill and cook as minimally as possible. 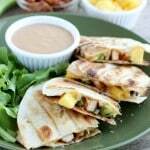 These campfire sandwiches are perfect for the grill or campfire. You can even bake them in the oven if you feel inclined to. 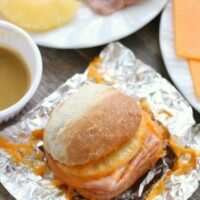 Year round hot sandwich dinner? Yes, please! 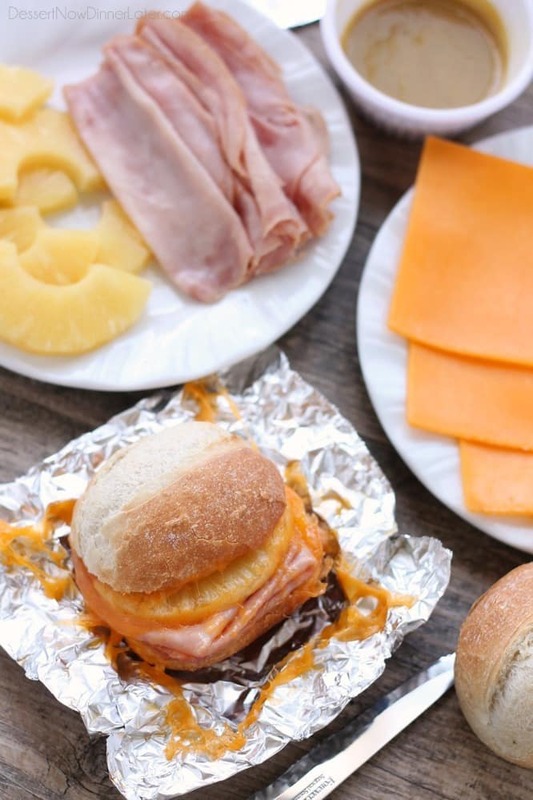 I love that you can eat these campfire sandwiches straight from the foil wrapper, so there is less cleanup. The best! So let’s just talk about these sandwiches for a minute. The bread is Rhodes Artisan French Rolls. They are my new favorite Rhodes product since I tried them at Easter dinner. 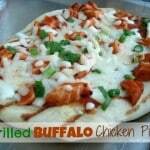 They are a Warm-N-Serv™ product, so they are ready in 8 minutes from the oven. Or you can microwave them, or just let them come to room temperature and eat them that way. But when they are warmed in the oven, they are crisp on the outside and soft in the center. Duh-licious! 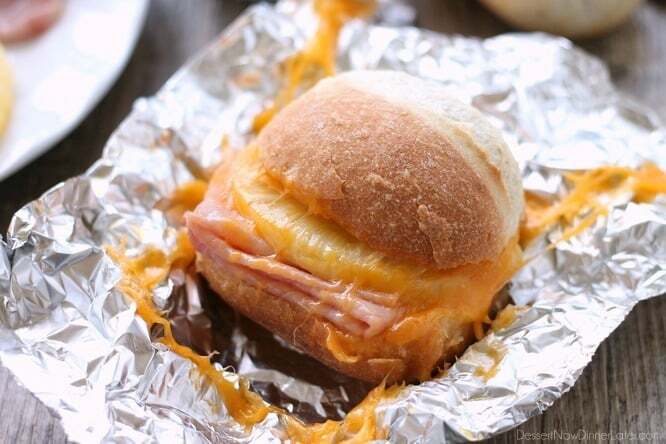 They are the perfect exterior for these sandwiches. 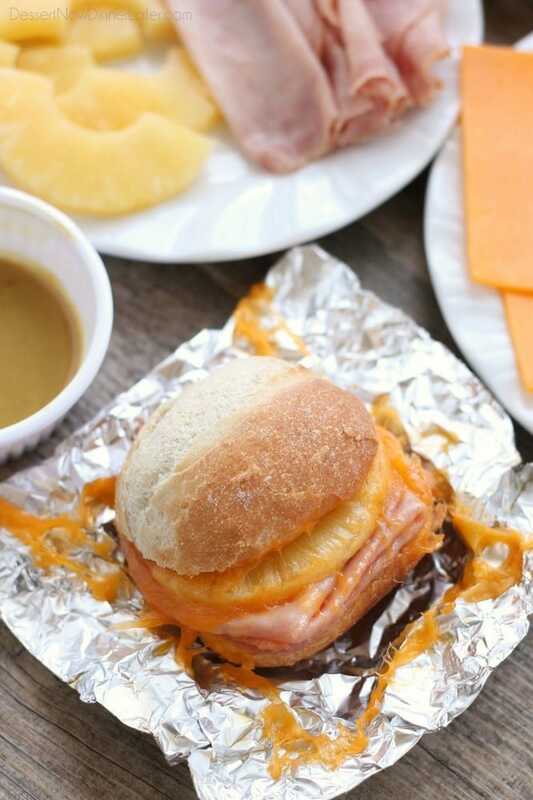 Cut a roll in half, smear it with homemade honey dijon, slices of ham, cheese, and pineapple and you’ve got yourself a taaaaasty tin foil dinner. It’s ridiculous how easy, and how delicious these are. 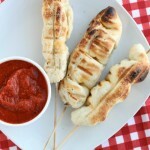 My kids are already asking to have these for dinner again. Maybe next time, we will be enjoying them while camping! Recipe added 8/14/16. For a step-by-step photo tutorial, visit the Rhodes Bake-N-Serv Blog. Cut rolls in half. Mix the Dijon mustard with the honey and spread the bottom of each roll with some of the honey-mustard mixture. Layer each sandwich as follows: Fold a few pieces of ham and place it on top of the honey-mustard. Top the ham with a pineapple ring, cut in half, if desired. Top pineapple with a slice of cheddar cheese, and the top half of the roll. 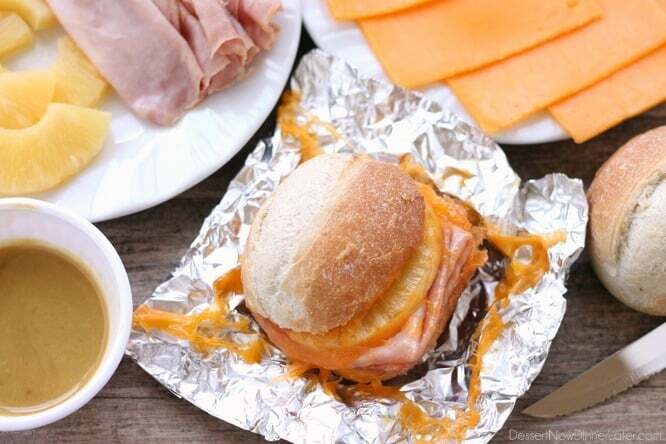 Wrap each sandwich well with heavy-duty aluminum foil. Place the sandwiches over hot coals or a grill rack until hot, about 20 minutes depending upon the temperature of your fire. Alternatively, you can bake these sandwiches directly on top of the center rack in a 400 degree Fahrenheit oven for 15 minutes. Carefully unwrap and enjoy! *Recipe lightly altered from Well Plated. Are you using canned or fresh pineapple rings? I used canned in the photos here, but fresh would be way better! Are you using pre baked rolls? They are on my list to trip next trip! Yes, they are pre-baked rolls. I used Rhodes Warm-N-Serv Artisan French Rolls. They taste so good!